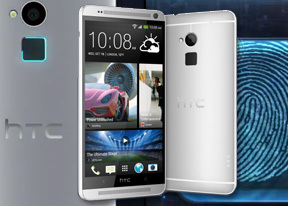 The HTC One Max is jam packed with connectivity options and covers a wide array of network frequencies. You get quad-band GSM, quad-band 3G and market-dependent LTE support, making the One Max a true globetrotter. The local wireless connectivity has Wi-Fi a/b/g/n and DLNA support (both client and server, for images, videos and music) and stereo Bluetooth 4.0. HTC has conveniently designed a special options screen, when you connect the One Max with a PC. The long list of options includes Portable Wi-Fi hotspot, settings, USB and Bluetooth tethering (the phone becomes a modem). NFC connectivity with Android Beam is present too. We found it to work hassle free with webpages and heavier items like photos. There's also a microSD card on the HTC One Max for expanding the 16/32 gigs of onboard storage. HTC's Portable Hotspot can support up to 8 devices, you can WEP, WPA or WPA2 encrypt the hotspot and you can enable "allowed users" only to connect or leave it open for all (unsecure, but the quickest setup). The HTC One Max comes with an MHL port, so if you plug a MHL dongle in, you can output HD video over a standard HDMI connection. The phone's UI is mirrored on the TV and with the FullHD resolution of the display, watching on an HDTV is a joyful experience. The HTC One Max also has a built-in Infrared port, which, coupled with the excellent remote app, allows you to remotely control a whole host of living room equipment. The smartphone can be setup to control all sorts of TV's, receivers, various video and audio players - pretty much any gadget that uses the standard Infrared remote controls. HTC One Max comes with the latest version of the Sensed-out Android web browser. Combined with the fullHD display and potent Snapdragon 600 power inside, the Jelly Bean browser makes for an awesome time on the web. HTC has also thrown in some extra buttons at the bottom of the screen, which seemed to pop up when you scroll back to the top of a page, which was getting a bit annoying at times. You see sometimes those buttons appeared along with the top bar, whereas on other occasions they remained hidden when the top bar was showing. Aside from being way too big, those mysteriously behaving buttons let you save a page in your bookmarks or reading list, view bookmarks, saved pages or tabs. You might want to enable Quick controls - they let you tap on any point on the edge of the screen and move your finger to select the desired option from a jog-dial menu. You can also request the desktop version of a site, instead of the mobile one. Another cool feature is preloading search results that the phone believes are relevant, speeding up the whole process. Happily, the HTC One Max comes with full Flash support in the browser. We tested a couple of games and videos and everything worked like a charm. That's not something many smartphones boast nowadays.